INDIANAPOLIS -- WITZ was honored by Gov. Eric Holcomb at the statehouse in Indianapolis Wednesday for its longevity and service to its employees, community and the state. The WITZ Network received the “Half Century Award” for its 70 years of service to Dubois County and surrounding communities, providing stellar music, local news, weather and sports. 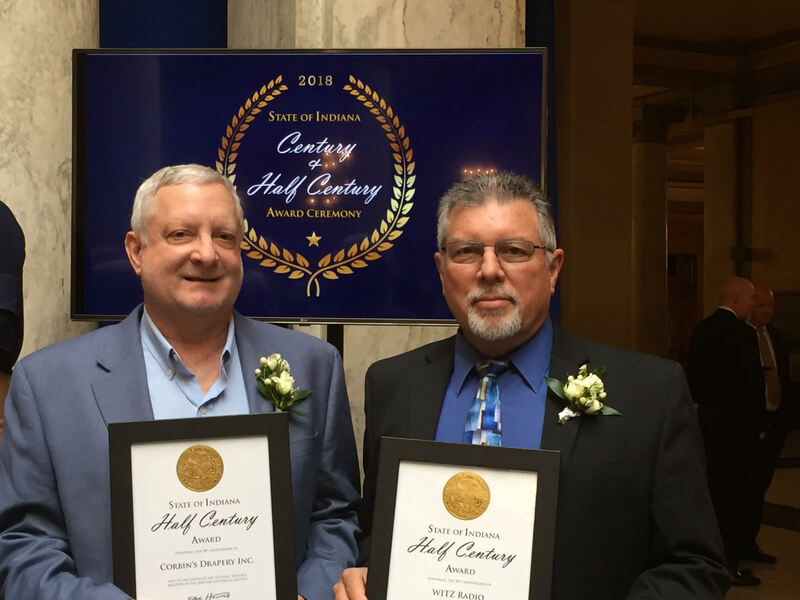 Gary Corbin of Corbin’s Drapery, a customized window treatment store, offers personalized decorated window design services for homes and offices, was also honored with a "Half Century Award" for 64 years of service to Dubois County. The Governor’s Century and Half Century Business Awards honor Hoosier businesses that have remained in operation for a minimum of 100 or 50 consecutive years and have also demonstrated a commitment to community service. Nearly 1,500 companies from across the state have been recognized during the 27-year history of the award.